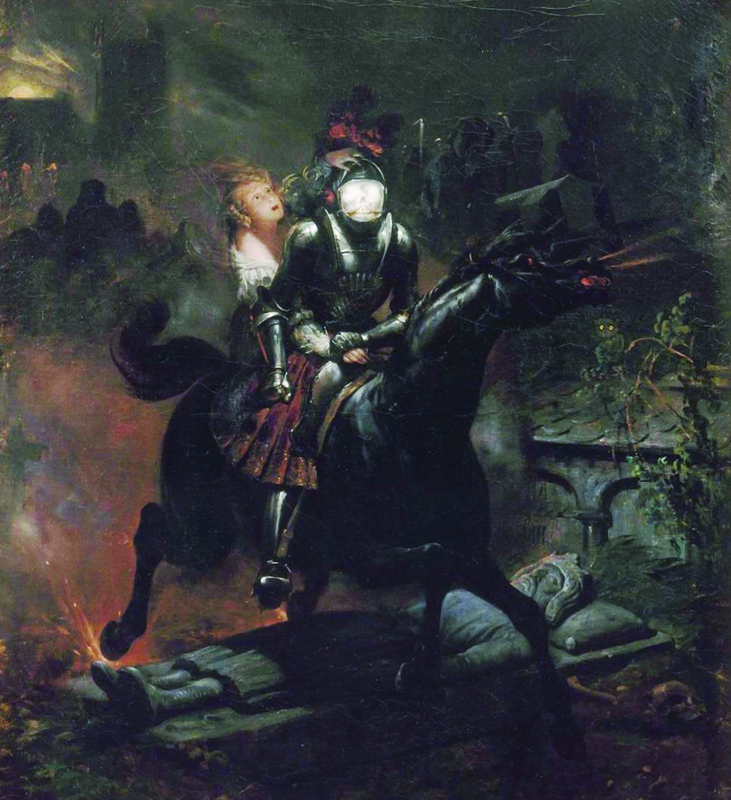 Detail from La Ballade de Lénore ou les Morts vont vite [The Ballad of Lenore, or The Dead Travel Fast], 1839, oil on canvas by French artist Horace Vernet (1789-1863). Courtesy of The Athenaeum. Click on the image to see the entire painting. First published in seven paperback numbers in New York (and simultaneously in Boston, Philadelphia, and Baltimore) in 1819 and 1820, Washington Irving’s The Sketch Book of Geoffrey Crayon, Gent. contains more than thirty selections: short stories, travel pieces, historical accounts, sketches of British town and country life, literary essays, and portraits of vanishing traditions, including five chapters describing an old-fashioned Christmas celebration at an English estate. Narrated by Irving’s fictitious alter ego, Geoffrey Crayon, the collection became the first American literary work to enjoy success in Europe, instantly making the 37-year-old author a celebrity abroad. 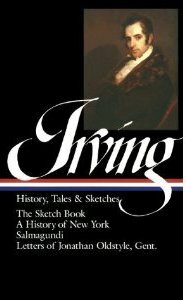 The Sketch Book includes Irving’s two most famous works, “Rip Van Winkle” and “The Legend of Sleepy Hollow,” both set in America but inspired by German folk tales. If we were asked to name the collection’s third most popular entry, we would probably point to “The Spectre Bridegroom.” In fact, during the last two centuries various book publishers have extracted this particular trio of stories and reprinted them either individually or together, often with illustrations. Like his two more famous stories, “The Spectre Bridegroom” was inspired by German legends, but this time Irving retained the location and period of the original material. The most obvious source is Gottfried August Bürger’s Lenore (1774), which Irving mentions in passing within the story itself. 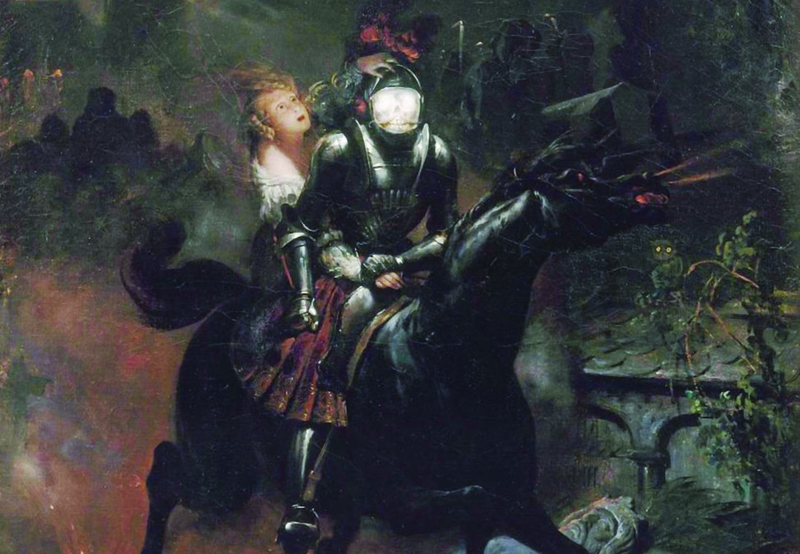 Bürger’s ballad depicts a young woman whisked away from her home on horseback by an apparition that resembles her lost fiancé, who had gone missing in action on the battlefield. The poem was first introduced to English readers in 1796, when the still-unknown Walter Scott published a loose translation with the title “William and Helen.” Irving, almost certainly familiar with the original German ballad, turns the tale on its head and presents a ghost story that is more burlesque than Gothic. He was a corpulent old Swiss, who had the look of a veteran traveller. . . . He was interrupted more than once by the arrival of guests, or the remarks of his auditors; and paused now and then to replenish his pipe; at which times he had generally a roguish leer, and a sly joke for the buxom kitchen-maid. I wish my readers could imagine the old fellow lolling in a huge arm chair, one arm akimbo, the other holding a curiously twisted tobacco pipe, formed of genuine écume de mer [meerschaum], decorated with silver chain and silken tassel—his head cocked on one side, and a whimsical cut of the eye occasionally, as he related the following story. Notes: Irving’s epigraph is from the Middle English romance The History of Sir Eger, Sir Grahame, and Sir Gray-Steele. The earliest extant copy is a Glasgow edition from 1669. The Heldenbuch (“Book of Heroes”) is a collection of fourteenth-century German epic poetry. Minne-lieders are love songs sung by medieval German troubadours. The great Heidelberg tun is an enormous cask for wine in the castle of Heidelberg. The first one was built in 1591. Saus und Braus are revelry and riotous living. On the summit of one of the heights of the Odenwald, a wild and romantic tract of Upper Germany, that lies not far from the confluence of the Main and the Rhine, there stood, many, many years since, the castle of the Baron Von Landshort. . . . If you don't see the full selection below, click here (PDF) or click here (Google Docs) to read it—free!